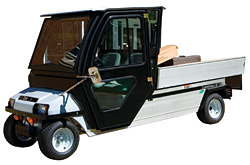 Power-train choices for the Carryall® 6 include 11.5-horsepower gas or 21-horsepower electric. The zero-emissions, electric model operates for 50 miles between charges, and the optional street-legal package, which travels 20-25 mph, qualifies for more than $1,200 in federal tax credits. The vehicle features a 6-foot bed and an aluminum chassis that resists rust and corrosion. Accessories include van boxes, ladder racks, plows, boom sprayers, and trailers.